Experienced Andreas Seppi first made short work of India's second highest-ranked Ramkumar Ramanathan by winning 6-4, 6-2 in the first tie as rising star Matteo Berrettini eased past India's best bet Prajnesh Gunneswaran 6-4, 6-3 in less than an hour. Former champions Italy pushed India to the brink of elimination by winning the singles rubbers to take a 2-0 lead into the final day of the Davis Cup Qualifiers at the Calcutta South Club on Friday. Experienced Andreas Seppi first made short work of India’s second highest-ranked Ramkumar Ramanathan by winning 6-4, 6-2 in the first tie as rising star Matteo Berrettini eased past India’s best bet Prajnesh Gunneswaran 6-4, 6-3 in less than an hour. Rohan Bopanna and Divij Sharan now have to pick up a win against Marco Cecchinato and Simone Bolelli in the doubles match on Saturday for the hosts to keep the tie alive. “We know we have a job hand. It will be a lot harder. No time to give up now,” non-playing captain Mahesh Bhupathi told reporters. India had bounced back from a similar situation to win in China 3-2 in Asia/Oceania Group I rubber last year — and he drew inspiration from the turnaround. “They are so much more experienced. If you take your chances, you get rewarded. We understand the pressure playing for the country. Strange things happen. It has happened in China. 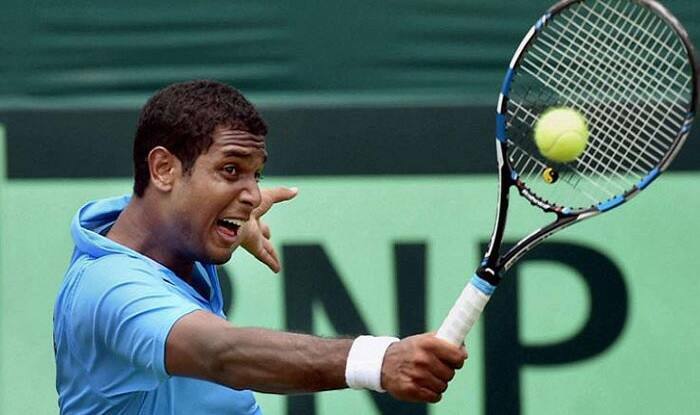 I know Italians are stronger than China but we will take one match at a time,” Bhupathi said. Berrettini, who was preferred ahead of top-ranked Marco Cecchinato to play the singles, took the lead with an early break in the first game of the first set. Berrettini, who had beaten Prajnesh in the Chengdu ATP last year, raced to a 15-40 with two big forehands — one inside-out and one cross court — before converting his break point. Prajnesh, ranked at a career best of 102, slowly eased into the match by staying within sight of Berrettini. The 29-year-old from Chennai wore a more settled took with his serves starting to get better. Both players kept on holding their serves until the Italian sealed the issue in the 10th game without a dropping a point. Berrrettini started the second set like the first, breaking Prajnesh to take a 1-0 lead. The 22-year-old started off with a sublime volley at the net and Prajnesh had no chance. The Indian remained in the game holding his serves till the seventh game. Berrettini then made it 5-3 racing through his service games before breaking Prajnesh again in the ninth game. After two early errors, Prajnesh clawed his way back to make it 30-all but the Italian capitalised on another error to secure a match point. Prajnesh hit a forehand smack into the middle of the net to concede Berrettini the match and Italy a 2-0 advantage. “I was dreaming about playing the Davis Cup as a child. I was really happy and focused on the match. I’m really enjoying the moment and I’m glad it went my way,” Berrettini told the media later. Earlier, Seppi, ranked 37, recovered from a slow start to break Ramanathan — who had eight aces up his sleeve but failed to convert two break points — in the ninth game of the first set and then win five points in a row to wrap up the first set in 41 minutes. In front of a motley crowd at the South Club which was hosting the meet after 16 years, it was a neck and neck battle till the eighth game as both players held on to their serves. Ramkumar failed to convert two break points in the second and eighth game before the Italian broke it with a cross-court backhand. Seppi went on to win four points in a row to seal the first set in style.